Classification and Kinship to Hamites. Term used in a general way to designate those peoples who are said in Gen. x. 21-30 to be the descendants of the patriarch Shem. These descendants are enumerated in the passage cited as Elam, Asshur (Assyria), Arphaxad, Lud, and Aram. Elam, a mountainous country on the east of Babylonia, was known in history before 4000 B.C. through its wars with the Babylonian king Eannadu (comp. Barton, "Semitic Origins," p. 180). Its language is, however, not Semitic (comp. Jensen in "Z. D. M. G." 1901, lv. 223 et seq.). It was probably reckoned among the descendants of Shem here because of its numerous Semitic immigrants. The identification of Arphaxad has been the subject of many wild guesses. The identification with Arrapachitis in the mountainous district of the Upper Zab is now generally abandoned; and there is general agreement that the last element of the name, , is the Hebrew "Kasdim" or Chaldeans. J. D. Michaelis revived this view, which Josephus ("Ant." i. 6, § 4) seems to have anticipated. Difference of opinion still exists as to the meaning of the first part of the name. Dillmann ("Genesis," i. 372 et seq.) and Holzinger ("Genesis," in "K. H. C." p. 105) hold that the first element is , which in Arabic and Ethiopic means "boundary," "limit," the whole word meaning "district of the Chaldeans." Hommel ("Ancient Hebrew Tradition," p. 292), who is followed by W. Max Müller (comp. Arphaxad), explains the name as a corruption of "Ur-kasdim"; but this view leaves the presence of the פ unexplained. The Egyptian article (Hommel) is out of place here. Cheyne (in Stade's "Zeitschrift," xvii. 190) explains the word as being composed of , name of the Assyrian province of Arbaha, and . Whatever the origin of the name, it no doubt refers to the Babylonians. Lud can here hardly refer to Lydia; its meaning is unknown. Aram refers to the Arameans, a well-known division of the Semites. The descendants of Aram are said (Gen. x. 23) to be: Uz, a region probably somewhere in the neighborhood of the Hauran (comp. Dillmann, l.c. i. 375); Hul andGether, two localities quite unknown; and Mash, probably the Mount Mash of the Gilgamish Epic (comp. Schrader, "K. B." vi. 203), which Jensen (ib. vi. 467) places in southwestern Arabia, but which Zimmern (in Schrader, "K. A. T." 3d ed., pp. 573 et seq.) identifies with the Lebanon and Anti-Lebanon Mountains. Dillmann and Gunkel identify it with Mount Masius north of Nisibis (comp. their commentaries ad loc.). The most important descendant of Arphaxad is said (Gen. x. 24) to be Eber ( ), whose name is clearly connected with that of the Hebrews ( ). Eber is said to have had two sons: Peleg, from whom Abraham and the Hebrews were descended (ib. xi. 10-27), and Joktan. The descendants of Joktan (ib. x. 26) are, so far as is known, Arabians. Almodad is as yet unidentified. Sheleph is the Arabic "Silf," a name of frequent occurrence in Yemen (comp. Glaser, "Skizze der Geschichte und Geographie Arabiens," p. 425). Hazar-maveth is Hadramaut, on the Indian Ocean. Jerah, according to Glaser (ib. ), whom Gunkel follows, is to be identified with Mahra. Hadoram is probably Dauram near Ṣan'a, while Uzal is Ṣan'a itself (Glaser, l.c. p. 426). Obal is probably the Ebal of Gen. xxxvi. 23 (ib. ), while Diklah and Abimael are unknown. Sheba is the well-known Sab'a of southern Arabia. Ophir, the land of gold in the days of Solomon, lay in Arabia, probably on the coast of the Persian Gulf (comp. Glaser, l.c. p. 368). Havilah was situated somewhere in Arabia, probably extending from the north-central part to the east (comp. Glaser, l.c. pp. 339 et seq.). Jobab is to be identified with the Jobaritæ of Ptolemy—an Arabian tribe. Uncertain as some of these names are, it is clear that, according to the Biblical classification, the Arabs, Babylonians, Assyrians, Arameans, and Hebrews were regarded as Semites, or the descendants of Shem. On linguistic grounds the Semites are usually divided into two groups: the northern and the southern Semites. The latter include the Arabs, Yemenites (Minæans, Sabeans, the modern Mehri), and the Abyssinians; the northern group, the rest. For the southern group this classification is excellent, certain well-marked features of the languages, such as the inner or broken plurals common to these Semitic tongues alone, distinguishing them from the northern group. For the latter group the classification is not so happy, as the northern languages are not so closely related to one another. It is clear from the great variations which they show that the peoples speaking them did not live as long together in one center and separate from the southern Semites. Northern Semitic really consists of three groups of languages: the Babylonian (including Assyrian), the Aramean (including Syriac and many dialects, from Samaritan to Mandæan), and the Canaanitish (including Phenician, Hebrew, and Moabite). These languages, intimately related to one another, are less closely related to the group of languages of which ancient Egyptian is the most important representative, and which is now usually termed "Hamitic" (comp. Zimmern, "Vergleichende Grammatik der Semitischen Sprachen," p. 5; Barton, l.c. pp. 9 et seq.). This Hamitic group consists of Egyptian, Coptic, the Berber languages (Kabyle, Tamachek, etc. ), and the so called Cushite languages (Bishari, Saho, Galla, Afar, Somali, Bilin, Chamir, etc.). Formerly, on account of certain animal names common to all the Semitic tongues, it was held by Hommel and others that the Semites separated from the Aryans in the high table-lands of Turkestan and wandered to Babylonia, whence they spread over the Arabian Peninsula and Syria. This view is now generally abandoned, most scholars agreeing that Arabia was the cradle-land of the Semites, while North Africa was that of the united Hamito-Semitic race, and that the Semites in prehistoric times separated from their kinsmen and migrated to Arabia, where their special racial characteristics and the distinguishing features of their languages were developed, and whence they were distributed over other Semitic countries. The life of the Hamites and the Semites in North Africa and Arabia developed in a desert country dotted with occasional oases. The hard conditions of life forced them, long before the dawn of history, from savagery into a barbarism in which the cultivation of the date-palm was a prominent feature. The family was loosely organized; descent was reckoned through the mother; and the most influential divinity was a goddess of fertility, the marks of whose cult are deeply embedded in the civilization of all the Semites. This deity was known in South Arabia as "Athtar"; in Abyssinia, as "Ashtar"; in Mesopotamia, as "Ishtar"; among the Arameans as "Atar"; and among the Canaanites and Phenicians as "Ashtart"; in the Masoretic text of the Old Testament the name is perverted to "Ashtoreth." This cult profoundly influenced even the religion of Israel. Like kinship of language, it is a mark of the kinship of the Semitic races. Its development and elimination constitute the story of Semitic evolution. Traces of a similar civilization and religion are found among the Hamites (Maspero, "Dawn of Civilization," pp. 51 et seq. ); and in both peoples it was due to the influence of oasis life (comp. Ashtoreth). 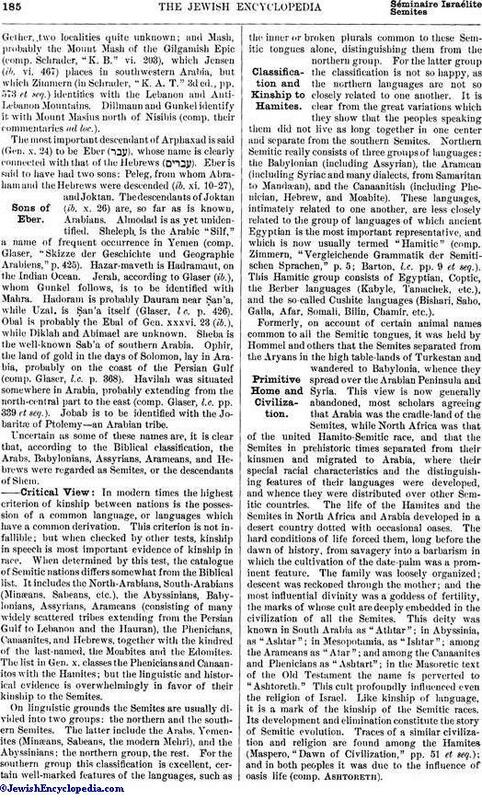 The Arabs in the desert fastnesses of central and northern Arabia have, on account of their isolated position, preserved unchanged more features of primitive Semitic character, custom, and language than any other Semitic nation; the conditions of life have always been too hard to permit the development of any high state of civilization. 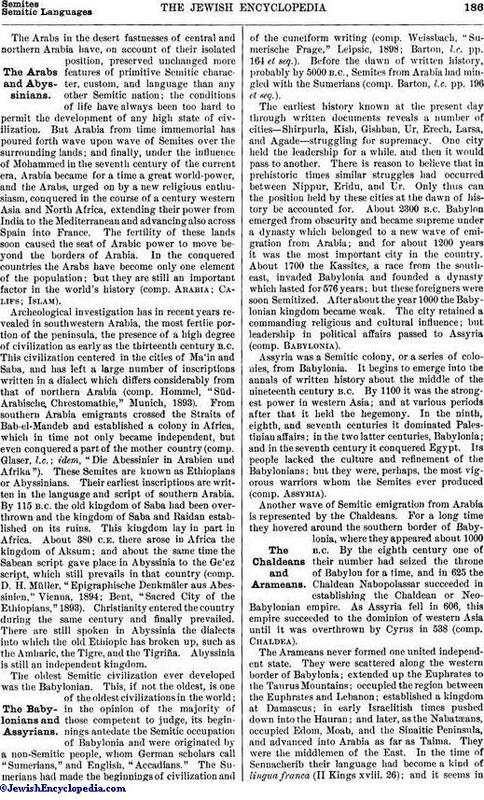 But Arabia from time immemorial has poured forth wave upon wave of Semites over the surrounding lands; and finally, under the influence of Mohammed in the seventh century of the current era, Arabia became for a time a great world-power, and the Arabs, urged on by a new religious enthusiasm, conquered in the course of a century western Asia and North Africa, extending their power from India to the Mediterranean and advancing also across Spain into France. The fertility of these lands soon caused the seat of Arabic power to move beyond the borders of Arabia. In the conquered countries the Arabs have become only one element of the population; but they are still an important factor in the world's history (comp. Arabia; Califs; Islam). Archeological investigation has in recent years revealed in southwestern Arabia, the most fertile portion of the peninsula, the presence of a high degree of civilization as early as the thirteenth century B.C. This civilization centered in the cities of Ma'in and Saba, and has left a large number of inscriptions written in a dialect which differs considerably from that of northern Arabia (comp. Hommel, "Süd-Arabische Chrestomathie," Munich, 1893). From southern Arabia emigrants crossed the Straits of Bab-el-Mandeb and established a colony in Africa, which in time not only became independent, but even conquered a part of the mother country (comp. Glaser, l.c. ; idem, "Die Abessinier in Arabien und Afrika"). These Semites are known as Ethiopians or Abyssinians. Their earliest inscriptions are written in the language and script of southern Arabia. By 115 B.C. the old kingdom of Saba had been overthrown and the kingdom of Saba and Raidan established on its ruins. This Kingdom lay in part in Africa. About 380 C.E. there arose in Africa the kingdom of Aksum; and about the same time the Sabean script gave place in Abyssinia to the Ge'ez script, which still prevails in that country (comp. D. H. Müller, "Epigraphische Denkmäler aus Abessinien," Vienna, 1894; Bent, "Sacred City of the Ethiopians," 1893). Christianity entered the country during the same century and finally prevailed. There are still spoken in Abyssinia the dialects into which the old Ethiopic has broken up, such as the Amharic, the Tigre, and the Tigriña. Abyssinia is still an independent kingdom. The oldest Semitic civilization ever developed was the Babylonian. This, if not the oldest, is one of the oldest civilizations in the world; in the opinion of the majority of those competent to judge, its beginnings antedate the Semitic occupation of Babylonia and were originated by a non-Sémitic people, whom German scholars call "Sumerians," and English, "Accadians." The Sumerians had made the beginnings of civilization and of the cuneiform writing (comp. Weissbach, "Sumerische Frage," Leipsic, 1898; Barton, l.c. pp. 164 et seq.). Before the dawn of written history, probably by 5000 B.C., Semites from Arabia had mingled with the Sumerians (comp. Barton, l.c. pp. 196 et seq.). The earliest history known at the present day through written documents reveals a number of cities—Shirpurla, Kish, Gishban, Ur, Erech, Larsa, and Agade—struggling for supremacy. One city held the leadership for a while, and then it would pass to another. There is reason to believe that in prehistoric times similar struggles had occurred between Nippur, Eridu, and Ur. Only thus can the position held by these cities at the dawn of history be accounted for. About 2300 B.C. Babylon emerged from obscurity and became supreme under a dynasty which belonged to a new wave of emigration from Arabia; and for about 1200 years it was the most important city in the country. About 1700 the Kassites, a race from the southeast, invaded Babylonia and founded a dynasty which lasted for 576 years; but these foreigners were soon Semitized. After about the year 1000 the Babylonian kingdom became weak. The city retained a commanding religious and cultural influence; but leadership in political affairs passed to Assyria (comp. Babylonia). Assyria was a Semitic colony, or a series of colonies, from Babylonia. It begins to emerge into the annals of written history about the middle of the nineteenth century B.C. By 1100 it was the strongest power in western Asia; and at various periods after that it held the hegemony. In the ninth, eighth, and seventh centuries it dominated Palestinian affairs; in the two latter centuries, Babylonia; and in the seventh century it conquered Egypt. Its people lacked the culture and refinement of the Babylonians; but they were, perhaps, the most vigorous warriors whom the Semites ever produced (comp. Assyria). Another wave of Semitic emigration from Arabia is represented by the Chaldeans. For a long time they hovered around the southern border of Babylonia, where they appeared about 1000 B.C. By the eighth century one of their number had seized the throne of Babylon for a time, and in 625 the Chaldean Nabopolassar succeeded in establishing the Chaldean or Neo-Babylonian empire. As Assyria fell in 606, this empire succeeded to the dominion of western Asia until it was overthrown by Cyrus in 538 (comp. Chaldea). The Arameans never formed one united independent state. They were scattered along the western border of Babylonia; extended up the Euphrates to the Taurus Mountains; occupied the region between the Euphrates and Lebanon; established a kingdom at Damascus; in early Israelitish times pushed down into the Hauran; and later, as the Nabatæans, occupied Edom, Moab, and the Sinaitic Peninsula, and advanced into Arabia as far as Taima. They were the middlemen of the East. In the time of Sennacherib their language had become a kind of lingua franca (II Kings xviii. 26); and it seems intime to have displaced both the Babylonian in Babylonia (comp. Aramaic "dockets" in Stevenson, "Assyrian and Babylonian Contracts"; Clay, "Business Documents of Murashû Sons") and the Hebrew in Palestine (comp. Aramaic Language). The Arameans appear in the inscriptions about 1500 B.C., by which time they had begun to migrate into Palestine. Hebrew tradition preserves the legend that Israel was of Aramean extraction (comp. Gen. xii., xxviii.-xxxii. ; Deut. xxvi. 5). On the Arameans comp. Paton, "Early History of Syria and Palestine," ch. vii., viii. ; Aram; Aram-Geshur; Aram-Maachah; Aram-Naharaim; Aram-Rehob; Aram-Zobah; Damascus; Nabatæans. The Phenicians and Canaanites were one race and spoke one language. Perhaps they came into Syria and Palestine as a part of that movement of races which gave Egypt her Hyksos kings about 1700 B.C. (comp. Paton, l.c. ch. v.). They never developed a consolidated kingdom, but formed small city dominions, over which petty sovereigns ruled. The Phenicians, who inhabited the little strip of land between Mt. Lebanon and the Mediterranean, became great sailors. They performed on the sea the part which the Arameans did on land, carrying Semitic influences to Greece and Egypt. It is commonly supposed that they originated the alphabet. Perhaps this is not true; but they were probably the distributors of it. The Canaanites, although conquered by the Hebrews, gave to the latter their language (comp. Canaan; Canaanites; Phenicia). 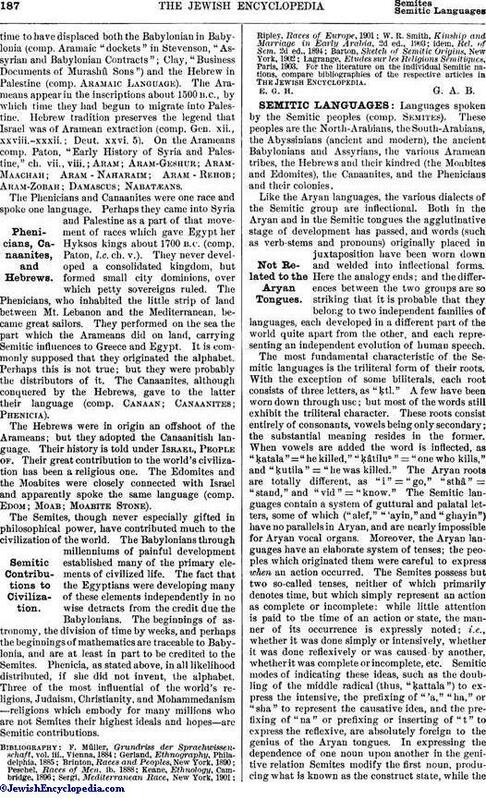 The Hebrews were in origin an offshoot of the Arameans; but they adopted the Canaanitish language. Their history is told under Israel, People of. Their great contribution to the world's civilization has been a religious one. The Edomites and the Moabites were closely connected with Israel and apparently spoke the same language (comp. Edom; Moab; Moabite Stone). The Semites, though never especially gifted in philosophical power, have contributed much to the civilization of the world. The Babylonians through millenniums of painful development established many of the primary elements of civilized life. The fact that the Egyptians were developing many of these elements independently in no wise detracts from the credit due the Babylonians. The beginnings of astronomy, the division of time by weeks, and perhaps the beginnings of mathematics are traceable to Babylonia, and are at least in part to be credited to the Semites. Phenicia, as stated above, in all likelihood distributed, if she did not invent, the alphabet. Three of the most influential of the world's religions, Judaism, Christianity, and Mohammedanism—religions which embody for many millions who are not Semites their highest ideals and hopes—are Semitic contributions. Lagrange, Etudes sur les Religions Semitiques, Paris, 1903. 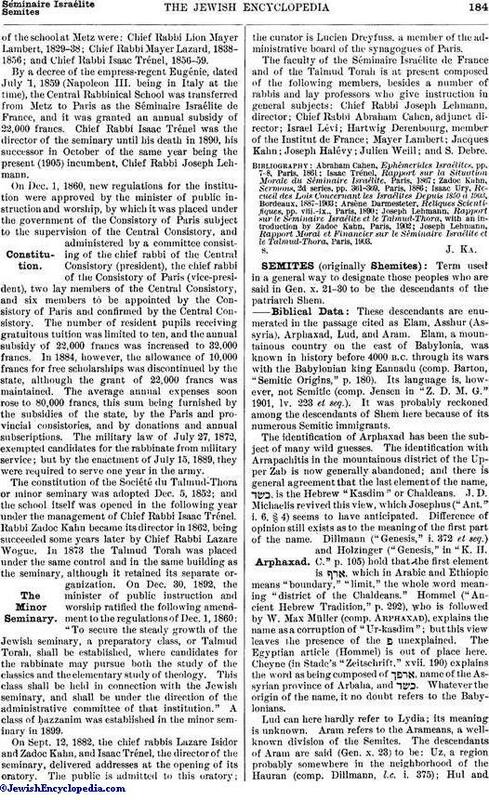 For the literature on the individual Semitic nations, compare bibliographies of the respective articles in The Jewish Encyclopedia.